Pascoe Vale have won their last 4 away matches in NPL Victoria (Australia). 86% of Avondale’s conceded goals were conceded away in NPL Victoria (Australia). Port Melbourne conceded at least one goal in 80% of their home matches in NPL Victoria (Australia). Pascoe Vale have scored 2 goals or more in each of their last 3 away matches in NPL Victoria (Australia). Northcote City conceded at least one goal in 90% of their home matches in NPL Victoria (Australia). 72% of Northcote City’s points have been earned at home in NPL Victoria (Australia). 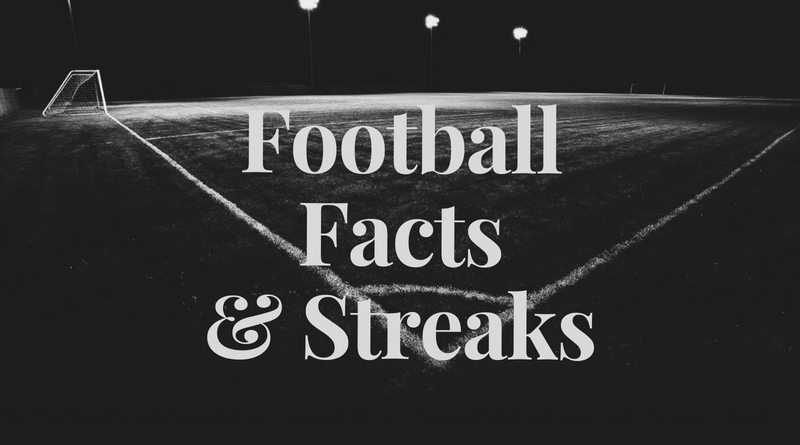 Avondale have scored in 82% of their away matches in NPL Victoria (Australia). Pascoe Vale have scored in 90% of their away matches in NPL Victoria (Australia). Pascoe Vale have been undefeated in their last 4 away matches in NPL Victoria (Australia). Pascoe Vale have scored in each of their last 8 away matches in NPL Victoria (Australia). Ceara conceded at least one goal in 71% of their home matches in Serie A (Brazil). Ceara have failed to score in 57% of their home matches in Serie A (Brazil). 75% of Ceara’s points have been earned at home in Serie A (Brazil). 32% of Ceara’s conceded goals occurred after the 75th minute in Serie A (Brazil). Shanghai SIPG have scored in each of their last 6 away matches in Super League (China). 69% of Beijing Renhe’s matches had under 2.5 goals in Super League (China). 90% of Dalian Yifang’s points have been earned at home in Super League (China). Shanghai SIPG have scored in each of their last 12 matches in Super League (China). 68% of Beijing Renhe’s points have been earned at home in Super League (China). Beijing Renhe have scored 73% of their goals at home in Super League (China). Shanghai SIPG have scored in 100% of their away matches in Super League (China). Dalian Yifang have scored 80% of their goals at home in Super League (China). 67% of Tianjin Teda’s points have been earned at home in Super League (China). Tianjin Teda have scored 76% of their goals at home in Super League (China). FC Honka conceded at least one goal in 80% of their home matches in Veikkausliiga. HJK Helsinki have scored in 80% of their away matches in Veikkausliiga. 76% of HJK Helsinki’s goals have been scored in the second half in Veikkausliiga. HJK Helsinki have scored 37% of their goals after the 75th minute in Veikkausliiga. Nagoya Grampus have failed to win in their last 15 matches in J1 League (Japan). Nagoya Grampus have failed to win in their last 7 home matches in J1 League (Japan). Sagan Tosu conceded at least one goal in 89% of their home matches in J1 League (Japan). Sagan Tosu have failed to score in 44% of their home matches in J1 League (Japan). Sagan Tosu have lost 56% of their home matches in J1 League (Japan). 67% of Jubilo Iwata’s conceded goals were conceded at home in J1 League (Japan). Ostersunds have been undefeated in their last 7 matches in Allsvenskan. Norrkoping have been undefeated in their last 8 matches in Allsvenskan. Malmoe FF have scored in 100% of their home matches in Allsvenskan. Norrkoping have scored in each of their last 14 matches in Allsvenskan. Ostersunds have scored in each of their last 7 matches in Allsvenskan. 72% of Norrkoping’s goals have been scored in the second half in Allsvenskan. Ostersunds conceded at least one goal in 86% of their home matches in Allsvenskan. Ostersunds have failed to score in 43% of their home matches in Allsvenskan. 61% of Ostersunds’s conceded goals occured in the first half in Allsvenskan. Elfsborg have scored 40% of their goals after the 75th minute in Allsvenskan. Malmoe FF conceded at least one goal in 71% of their home matches in Allsvenskan. Norrkoping have scored in 100% of their away matches in Allsvenskan. 70% of Norrkoping’s points have been earned at home in Allsvenskan. Norrkoping have been undefeated in their last 4 away matches in Allsvenskan. Norrkoping have scored in each of their last 6 away matches in Allsvenskan. 29% of Norrkoping’s conceded goals occurred in the first 15 minutes in Allsvenskan. Midtjylland ended draw their last 3 home games in Superligaen. Esbjerg scored in last 3 away games in Superligaen. Esbjerg scored in last 3 games in Superligaen. Zaglebie has over 2.5 goals in their last 3 games in Ekstraklasa. Legia scored in last 4 games in Ekstraklasa. Zaglebie Sosnowiec has over 2.5 goals in their last 5 games in Ekstraklasa. Legia has over 2.5 goals in their last 3 games in Ekstraklasa. Zaglebie Sosnowiec has under 2.5 goals in their last 5 away games in Ekstraklasa. Zaglebie won their last 3 games in Ekstraklasa. Legia scored in last 3 away games in Ekstraklasa. Zaglebie scored in last 3 home games in Ekstraklasa. Legia has under 2.5 goals in their last 4 away games in Ekstraklasa. Legia allowed opponents to score over 1.5 goals in last 6 away games in Ekstraklasa. Vojvodina scored in last 3 away games in Superliga. Cukaricki scored in last 5 away games in Superliga. Vojvodina scored in last 5 games in Superliga. Cukaricki has over 2.5 goals in their last 3 away games in Superliga. Rad Belgrade lost their last 3 games in Superliga. Cukaricki scored in last 5 games in Superliga. Rad Belgrade scored in last 3 home games in Superliga. Zurich has under 2.5 goals in their last 4 away games in Super League. Zurich ended draw their last 3 away games in Super League. Grasshopper scored in last 3 home games in Super League. Zurich allowed opponents to score over 1.5 goals in last 7 away games in Super League. Basel has over 2.5 goals in their last 6 games in Super League. Neuchatel Xamax has under 2.5 goals in their last 4 home games in Super League. Basel lost their last 5 games in Super League. Neuchatel Xamax scored in last 26 games in Super League. Neuchatel Xamax scored in last 13 home games in Super League.